Developed a system (equipment and process) to evaluate inks and substrates for the manufacture of Organic Light Emitting Diodes using long chain molecule based materials in industrial inkjet print heads. Small substrates (up to 8”x10”) can be printed with ink from up to 4 reservoirs. 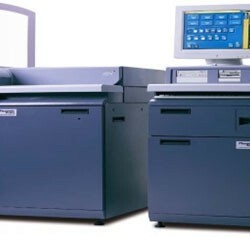 Printing is performed in a dry nitrogen atmosphere. 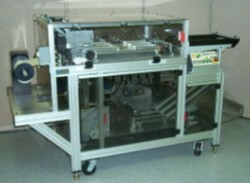 Developed a four color workgroup EP printer using DLP (digital light processing) micromirror array for exposure. The project included initial concept though prototype manufacturing. From concept to working prototypes in just under 2 years; the prototypes met all performance and cost goals. Custom manufacturing equipment that takes large format photo prints, folds and trims them, inserts adhesive in the fold and laminates the fold together to form a semi-rigid page for use in a photo album. Client had a handheld data entry unit. Designed, developed and integrated a thermal printer and scanner to enhance data input and output and make the unit look as if it was always intended to have the scanner/printer. Tooled the unit and delivered 33,000 units to client. 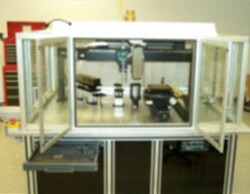 Designed developed and manufactured a check scanner to be embedded in an ATM. Scanner accepted a range of check sizes and conditions, scanned both sides, performed a magnetic scan and printed on the back of the check. 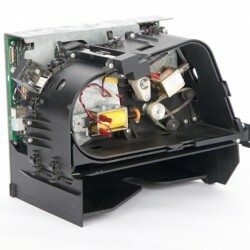 Checks can be returned to customer or stored in the unit. All mechanical, electrical and firmware functions completed to specification. 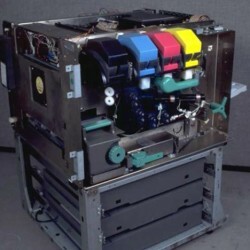 This system used inkjet technology to make very high quality photo prints on a web. The web was then laminated with a high quality transparent polymer, for moisture and fade resistance, and then cut and sliced with an integral two-axis paper cutter (across and perpendicular). Using proprietary software, the system automatically produced the maximum number of finished prints in a wide range of sizes without manual intervention, minimizing paper usage.